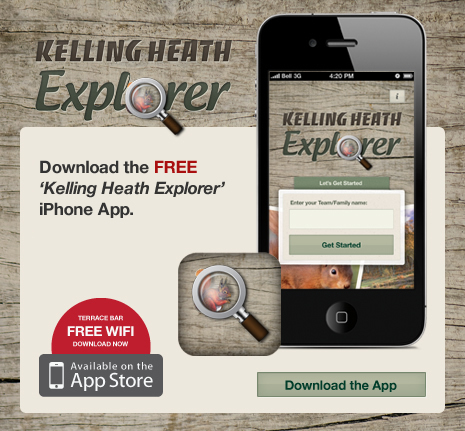 Kelling Heath Explorer - We Are delighted to announce the launch of the NEW 'Kelling Heath Explorer' iPhone App. This App can be enjoyed by all ages. (Under 16?s to be accompanied by adult) Explore a choice of two new specifically designed trails on either foot or bike, use the maps and descriptions within the app to follow the waymarker symbols, find the trail checkpoints, unlock the questions and earn explorer badges. WiFi is available in the Terrace Bar and no purchase is necessary. Simply ask at the bar for a WiFi ticket, input the code and download the Kelling Explorer App available from the Apple App Store.